From an article in the 1970 Oswego Classic program, "The Eagle". One of Canada's favorite drivers, Harold 'Little Ben' Brown of Brantford is eagerly looking forward to this year's Classic. He seems to have everything going for him - a beautiful car, lots of driving talent, 12 years experience and a fine crew. This year's sharp new roadster was built over the winter by Harold and car owner Harv Docksteader. Docksteader and mechanic Ted Welch commuted from Guelph to Brown's Motors in Brantford to work on the car almost every night, all winter. This car is the seventh built by Brown during his 12 year racing career. It's entirely their own design although Harold admits that features from several cars particularly 10 pins and 01 were built in. 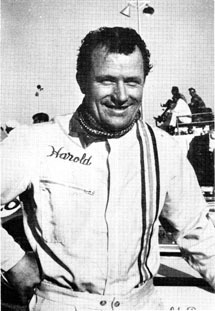 Harold got his start in 1959 when he bought Bill Walsh's car and started campaigning at Nilestown, Delaware and the C.N.E. He later bought Dave Stephenson's number 5 and had great luck with it for two years. One of the early ears that he built was a super-light aircraft tubing car that really looked great until it tried to go through the C.N.E. wall one night. Harold was badly bruised and had to completely rebuild the car. Brown won one feature at Bridgeport, numerous "B" class championships arid has been one of the steadiest performers around the circuit He has been running with the fast ears for the past three years despite the fact that his car was always slightly underpowered, he has been very successful. He placed third overall in the combined Delaware - Nilestown Flamboro points championship a few years back and this speaks well for his consistency. 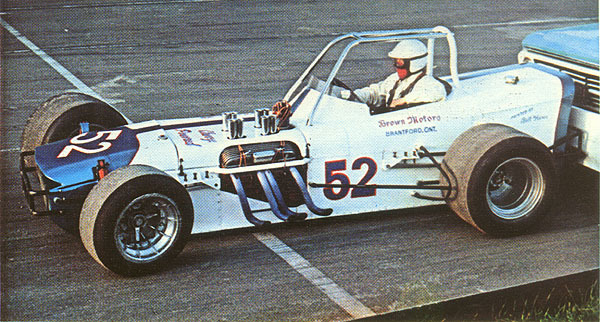 Harold has campaigned at Sandusky and Oswego with his supermodified and at Holland, NY with his late model. He has run a Chevy but both he and car owner Harv Docksteader are Ford men and would like to try a 351 engine once racing goodies become available. Harold is 35 years old and runs a garage in Brantford. His wife Gloria and six year old son Doug never miss a race. The old familiar 1-10 has disappeared now as three digit numbers are not allowed but the nickname Little Ben has stuck with Harold since his school days. His explanation for the number 1-10 was always that it took one guy to drive the car and ten guys to fix it, hence the 1-10. A really fine competitor and one to watch closely this weekend -car 52- Harold 'Little Ben' Brown.